Prior to a delicious Korean BBQ dinner later this evening, our afternoon included an exceptional introduction and tour of the Hebron off-shore platform with Exxon and their Engineering, Procurement, and Construction (EPC) partner WorleyParsons-Fluor. The final destination for the Hebron will be off the coast of St. John’s, Newfoundland in Canada. The Hebron’s location is about 100 km away from where the Titanic sunk, which results in a design challenge of 1,000 Arctic glaciers passings per year and also 10m-15m tall waves. The 100-year and even 1,000-year wave conditions were modeled with load cells by the engineering design team. In total, the Hebron will extract 220,000 barrels of oil per day. Teams of 220 staff members will work in 3-week rotational periods to operate the Hebron. The Hebron will total a weight of about 60,000 tons, of which is comprised of 46,000 tons from the UPM noted below. 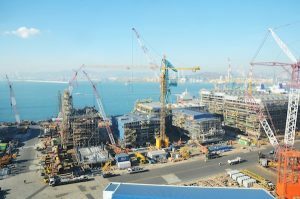 As a comparison of orders of magnitude, the Hebron is speculated to cost over $10 billion and is approximately 4-5 times the size of Exxon’s Point Thomson project. Along with this, the UPM is strategically divided horizontally into two components: a Process half and a Utilities half. Since the Process half includes the tanks, pumps, and dangerous activities involving hydrocarbon combustion, the workers’ living quarters are located on the Utilities half of the UPM. The Utilities half contains more stable pieces of equipment such as generators. Overall, incorporating safety into the design will help protect workers in the event of an emergency situation. The DES includes the derrick system that drives pipes down to the reservoir of oil. 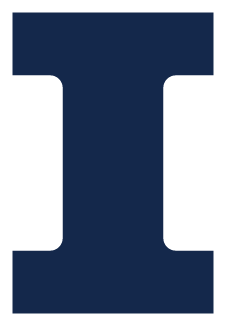 The DES has the capability to drill up to 6 miles deep, but will likely not need this reach for any of the 52 wells to be drilled over 10 years. 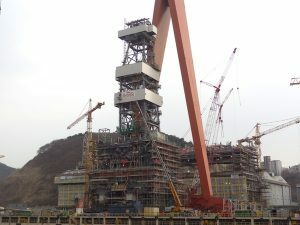 Both the UPM and DES are being constructed at the Hyundai Heavy Industries (HHI) Shipyard with their unique modular construction method. HHI utilizes several shops that construct individual blocks, which are then driven on self-propelled motor transports (SPMTs) to the dock. These blocks are craned into position until the entire platform is constructed. It is estimated that every hour of work at HHI translates to 3-5 hours of work had the Hebron been built on-site. When ready for shipment in April 2016, skids will be placed beneath the structure, and it will be maneuvered onto the “Blue Marlin” barge for its 2-month journey to St. John’s. The construction for the GBS and ancillary structures will take place at St. John’s. The GBS is essentially a massive concrete base and storage tanks for the UPS and DES to rest upon. The GBS is made with 200,000 tons of concrete that will sit in 100m of water. As a reference of size, the base diameter is wide enough to encapsulate the footprint of the Houston Texans’ NRG stadium and is as tall as the Trump Tower in Toronto. The ancillary structures to be constructed include the living quarters, life-boats, and a helipad. 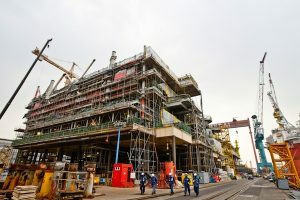 An interesting perspective from the WorleyParsons-Fluor design team helped us understand the magnitude of investment by Exxon in these projects. Before even construction begins, the design team will conduct Front End Engineering Design (FEED) that will help develop a cost estimate within 10%-15% accuracy. After years of working on this design, it will be up to Exxon to give the project a Green or Red light. Between the cost of design and prior exploration, there are billions of dollars invested before a project is even executed. Some additional design considerations include the weight limit of the GBS, transportation weight limits, and tailoring the construction sequence to the shipyard at which it will be built. As a whole, we gained an extensive insight to the oil and gas industry’s need for technical accuracy and efficient project management, which are necessary due to vast amounts of investment. We appreciate the time and participation from all the Exxon and WorleyParsons-Fluor team members. In particular, we would like to give a special thanks to Jennifer Henry, who helped organize the day’s visit and also happens to be a GLCM alumnus!